Apart from the Airbus corporate jet, the government wants to sell five smaller ATRs and three helicopters belonging to Mallya's Kingfisher Airlines (KFA), which owes banks more than Rs 9,000 crore and stopped flying in 2012. The aircraft have been attached by the service tax department. "We are going ahead with the auction," said a senior Central Board of Excise & Customs ( CBEC) official. The reserve price for the aircraft will be set by MSTC Ltd, a government company that has expertise in auctions. The PSU will auction the personal jet on May 15-16, said the official. Authorities don't see any hindrance to such a plan as Mallya's personal jet was on lease and no entity has approached the authorities or the courts regarding the plane. A standard Airbus A319 has a list price of nearly Rs 600 crore. Of the total Rs 812 crore, Rs 32 crore is tax that was collected from passengers but not deposited with the government. The tax department had sought Mallya's arrest last year but was rebuffed by a Mumbai metropolitan magistrate on the execution of a personal recognisance bond of Rs 50 lakh. The tax department had argued that Mallya could leave the country and not return to face trial and had asked the court to direct him to surrender his passport. In his February 16, 2015, order, the magistrate directed Mallya to present himself in court when required. The department challenged the order in the Bombay High Court soon after. With the plea pending for a year, the department filed a fresh miscellaneous case on March 2 seeking a direction to secure Mallya's presence. The case will now be heard on March 28. In addition, the company faces a separate case related to service tax dues. Airplane manufacturer Airbus SAS on Thursday said it will continue to reduce aircraft orders placed by Vijay Mallya-promoted Kingfisher Airlines Ltd, which has not flown since 2012. Airbus executives said Mallya’s Kingfisher Airlines had ordered five Airbus A380, the largest civilian airplane ever built, and 10 A350 planes. Joost Van dee Heijden, vice-president, marketing Asia and customer affairs at Airbus SAS, said the company is continuing to reduce its orders from the order book list. He said the current 70% of the market share of Airbus is excluding Kingfisher Airlines’ orders. He did not disclose details about other orders, including Airbus A330s and Airbus A320s. However, the website of Airbus still features the name of Kingfisher Airlines along with its then low-fare subsidiary Kingfisher Red. Lenders to Kingfisher Airlines (KFA) have put on the block the trademarks of the airline, including the famous flying bird logo which was adopted from the UB Group's iconic beer brand. The reserve price for the trademarks, which will be auctioned on April 30, has been fixed at Rs 366 crore. The trademarks include the tag lines 'Fly the Good Times', 'Funliner' and 'Fly Kingfisher' in addition to the brand name and the logo, which have been separately copyrighted by Kingfisher. Kingfisher Airlines founder Vijay Mallya reportedly approached lenders through one of his companies seeking a settlement by paying INR20 billion (USD302 million) (financialexpress.com, 30-Mar-2016). This is a fraction of the INR70 billion (USD1.1 billion) owed to creditors with the consortium of lenders led by State Bank of India (SBI) turning down the offer due to the shortfall in amount. United Breweries has said the Kingfisher logo that belonged to Kingfisher Airlines can only be used for aviation and warned of legal challenges if it is used in other categories. In the first official comment on the issue after the banks' decision to auction the logo, United Breweries, the maker of Kingfisher and Kalyani Black Label beers, said a buyer will be able to use the logo only to set up another airline and for nothing else. Using the logo for any other purpose will be legally challenged by UB since it holds exclusive rights to the brand, the company warned. "We are not expecting any bids at the auction, but we have to follow the process," said a banker on the condition of anonymity. "If we don't put these intangible assets on the block there will be pressure from the Central Bureau of Investigation and Central Vigilance Commission alleging that we didn't do our fullest to recover dues." The service tax department is set to auction defunct Kingfisher Airlines chairman Vijay Mallya’s luxury Airbus A319 to recover part of dues of over Rs 800 crore. The department hopes to raise Rs 150 crore from the auction. Over a dozen monogrammed towels and napkins bearing the initials of Vijay Mallya, a copy of Ambani & Sons by Hamish McDonald and DVDs of over 100 films curated by Mallya himself will be sold along with the aircraft on May 12. The service tax department, which seized the Airbus A319 in December 2013, has appointed Air India as technical consultant for sale of the aircraft. Air India has also been entrusted the task of cleaning the aircraft before potential buyers begin physical inspection. Sources said the department will not remove personal belongings of Mallya, including a framed photograph of his family, from the aircraft. “Everything that was inside the aircraft when it was seized like framed paintings of deities, bar accessories, some of the finest wine and whisky glasses, toiletries and electronic goods will be handed over to its new owner after the auction. It is on ‘as is where is, as is what is, whatever there is and no complaint’ basis,” sources said. The aircraft is owned by C J Leasing (Cayman) Ltd and was given on lease to Kingfisher. Last year, the Bombay High Court observed there was no legal trouble in auction of the aircraft which is on financial lease. Proceeds of the sale will be deposited with the High Court. 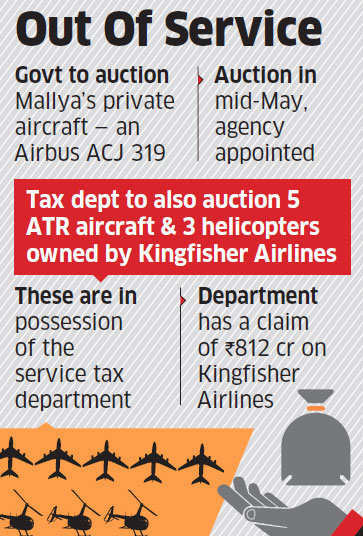 Other than Mallya’s jet, five ATR aircraft and two helicopters have been confiscated by the service tax department. After the department published an advertisement on March 24 for the sale of the Airbus, several foreign and Indian companies have shown interest, sources said. United Breweries (UB) said the Kingfisher logo that belonged to Kingfisher Airlines can only be used for aviation and warned of legal challenges if it is used in other categories (Economic Times, 31-Mar-2016). UB said using the logo for any other purpose will be legally challenged by UB since it holds exclusive rights to the brand. This marks the company's first official comment on the issue after the decision to auction the logo as part of efforts to recover dues owed to creditor banks. Thus ensuring that nobody in his/her right mind will ever want to acquire the logo. Do you even read before you post ? The same article is posted one post above yours ! Four years after the scheduled operations of Kingfisher came to an end and the Air Operator Permit had lapsed, seven aircraft of the airline remain at the Chennai airport. The dues include payment for various facilities over the years including parking, landing and usage of hanger charges, sources said. But the dues of Kingfisher to Airports Authority of India (AAI) for availing various facilities stand at Rs. 294.57 crore, including interest. Sources with AAI said that of the seven aircraft, three belonged to Kingfisher and the remaining four were leased from private companies. The four leased aircraft were deregistered by the respective companies with the Directorate General of Civil Aviation (DGCA), sources added. “But the companies are yet to take possession of them since there some issues are involved,” a source said. Three years ago, the Ministry for Civil Aviation announced its decision to withdraw the International Bilateral Traffic Rights given to the airline between 2008 and 2011. When the airline started operations in Chennai way back in 2008, it used to operate 60 flights a day from the city. But in 2012 itself, the operations came down to 45 before the operations stopped completely. Service Tax Department has deferred the auction of liquor baron Vijay Mallya's private jet to recover Rs 535-crore dues to June 29-30, after just one potential bidder showed interest, an official said. The auction was earlier scheduled for May 12-13. The Department, which had invited the bidders globally for the auction to get maximum sale price in its attempt to recover dues of Rs 535 crore from Mallya-promoted Kingfisher Airlines (KFA), got only one bidder. However, even this sole bidder didn't deposit Rs 1 crore earnest money with Metal Scrap Trade Corporation (MSTC), a Government enterprise which is acting as auctioneer, within the scheduled time, and hence the auction will not be held on the scheduled date and fresh date has been decided by MSTC. "We got only one registration request from the Netherlands Government for participating in the bidding of the plane as of May 10. However, as per the norms, the bidder has to deposit an earnest money amounting to Rs 1 crore and the Netherlands Government had not deposited the earnest money with reason unknown to us," a Service Tax Department Official told today. "Therefore, we informed the Bombay High Court (which had allowed the auction on the Department's plea) about the position and the court has given the department the liberty to adjust the date for auction," he said, adding "the department discussed the matter with Air India Engineering who are the technical consultants for the auction and MSTC and finally we decided to hold the auction of the plane on June 29-30." India’s tax authorities will auction off an Airbus Corporate Jets ACJ319 aircraft previously used by Vijay Mallya, the former chairman of defunct Kingfisher Airlines. The auction will open on Wednesday 29 June and close on Thursday 30 June, according to Indian government auction website MSTC. The aircraft bears registration number VT-VJM and the manufacturer’s serial number 2650. Flightglobal’s Fleets Analyzer database shows that it owned by Caymen Islands firm CJ Leasing. The A319ACJ is being qouted too high...at this rate it will never get picked up. Vijay Mallya’s personal jet went up for auction for a second time today, in an attempt to recover over Rs 9,000 crore that Mr Mallya owes banks in loan defaults for his now defunct Kingfisher Airlines. The reserve price was set at Rs 152 crore and an earnest deposit of Rs 1 crore was mandated to take part in the auction. But to the authorities’ surprise, the private jet of Mr Mallya, who is known for his lavish lifestyle, could only attract one potential buyer, and a single bid of Rs 1.09 crore. “The company has offered a paltry Rs 1.09 crore against our reserve price of Rs 152 crore. Since the bid was much less than our reserve price, we rejected the offer,” a Service Tax Department official told Press Trust of India. The official said the department may go in for another round of bidding involving domestic aviation companies alone, or lower the reserve price, depending on what the government chooses to do. The investigation into an alleged fraud at the now defunct Kingfisher Airlines Ltd has run into an unlikely hurdle: the airline’s books of accounts have vanished. Executives of the grounded airline have informed officials of the Serious Fraud Investigation Office (SFIO) that a vendor had carted away the computers and servers that stored the financial accounts of the airline for non-payment of dues. The airline claims that it has no backup of the files, two SFIO officials said, requesting anonymity. SFIO, which works under the ministry of corporate affairs, is seeking details from former employees of the airline, lenders and audit firms about loans taken out by Kingfisher Airlines and the collateral for these. “It was rather strange when the top management representatives of Kingfisher Airlines informed us that the airline has lost its books and accounts as vendors pulled out the system which had the accounts. The airline executives claimed that they never had a backup,” said one of the SFIO officials cited above. The second official said the investigation has been delayed owing to the disappearance of the books of accounts. “However, we are seeking details from lenders and all financial institutions involved with Kingfisher Airlines. We are going ahead with questioning the top officials,” he added. SGI Commex claimed to have bought airbus A319-133 at a price of Rs 27.39 crore ($ 4.1 million), which was nearly one-sixth of the reserve price. An aircraft of embattled Kingfisher Airlines is slatted for a re-auction as the bidder SGI Commex informed the Bombay High Court on Monday that they want to withdraw their bid. The auction of the jet was challenged by the Mumbai airport, who claimed an unpaid amount of airport fees. As per an order passed on August 22, SGI Commex will have to pay an additional amount under taxes, hangar charges and the cost of equipment to be installed to make the aircraft air-worthy. Justice SC Dharmadhikari was hearing a plea filed by the service tax department, challenging a 2014 decision of the debt recovery tribunal that had waived off dues worth Rs 18 crore of the Kingfisher Airlines. Last week, court had observed that Mallya "Couldn't have come up with a better name than 'Kingfisher' for his entity, for just like the bird can fly with no boundaries to prevent it, he flew away." Service Tax Department had informed the court that it wished to recall the auction as the highest bidder who bid for the airbus had bid only "81 per cent of its total cost". Its likely that the aircraft will undergo rebidding to recover dues. Additional Solicitor General Anil Singh said that both the Union government and the Service Tax Department were committed to selling the airbus and only needed to work out some modalities. SGI Commex claimed to have both airbus A319-133 at a price of Rs 27.39 crore ($ 4.1 million), which was nearly one-sixth of the reserve price. On June 30, the department had conducted an e-auction for the airbus advertising it as "designed exclusively for exotic and luxurious use" but recalled it after the highest bidder at the time offered just Rs 1 crore. In August this year, it conducted a second auction saying that it had set the reserve price of the airbus at Rs 152 crore. That's when SGI Commex bought it at a much lower price. When the aircraft is under custody of the Mumbai airport, shouldn't they have the first right to auction it to reclaim their dues? Why is the Service Tax dept auctioning it? Who decides who gets to auction? First right is always with the taxation authority. Clear your tax payments, only after that other payments including salaries of employees, rent etc. can be made. The Debt Recovery Tribunal on Tuesday ordered global aerospace major Airbus Industries to deposit Rs 192.5 crore with it in eight weeks towards pre-delivery payment a consortium of banks made for purchase of aircraft by defunct Kingfisher Airlines of tycoon Vijay Mallya. Tribunal presiding officer K. Srinivasan passed the order on an amended petition the consortium filed to recover the payment made for the aircraft on behalf of the airline over a decade ago. The consortium includes state-run Oriental Bank of Commerce, Corporation Bank and United Bank of India. Though Airbus and Kingfisher signed the purchase deal in 2005, the aircraft were not delivered even till the debt-ridden airline was grounded in October 2012. When Airbus failed to repay, the consortium made budget carriers Indigo and GoAir a party to the case under “garnishment” and sought a direction to them to deposit the money with the tribunal instead of paying the former (Airbus) with which they also placed orders to buy its aircraft. Garnishment is a legal process where payment towards a debt owned by an individual or a firm can be paid by a third party, which holds money or asset that is due to the individual or firm directly to the creditor. A court or tribunal order of garnishment allows a creditor (consortium) to take the property of a debtor (Kingfisher) when it does not possess the asset (aircraft). The low-cost airlines rejected the consortium’s plea, as making them party to the debt recovery case would affect their business operations. Airbus too objected to such an arrangement (garnishee order) as it was not a party to the case and neither a borrower or defaulter. Consortium counsel, however, contended that the tribunal had jurisdictional powers to adjudicate the case, as the agreement was signed in India between banks, Kingfisher and Airbus, and the aircraft were to be delivered in India. Agreeing with the counsel’s view, the tribunal on September 27 directed the consortium to amend its petition in the garnishee proceedings for making Airbus deposit any amount it receives from an Indian carrier for purchasing aircraft with it. The Karnataka High Court on Friday ordered winding up of bankrupt businessman Vijay Mallya's defunct carrier Kingfisher Airlines, paving way for an official liquidator to take charge of assets and books. Justice Vineet Kothari passed the order on a day when a lawyer representing the airline withdrew from the case, claiming that he had received no instructions from his client to appear on behalf of the airline, said two people who were present at the hearing. The court was ruling on the winding-up petition filed by Aerotron, a UK-based aircraft component supplier and one of Kingfisher's many creditors. Kingfisher, controlled by the flamboyant Mallya, now in London, owes more than $1 billion to Indian banks and several hundred crores to airports and tax authorities. "The petition was filed by Aerotron in 2012 and we had filed our objections then. The court took note of the objections and passed its order (for winding up)," said SV Rajesh, the lawyer representing Kingfisher. The airline owed Aerotron about $5 million, he added. Emails sent to a spokesperson for Kingfisher Airlines and Aerotron's London office didn't elicit a response. Recently, the State Bank of India wrote off Rs 7,000 crore in loans, including that of Mallya-promoted Kingfisher Airlines. The Union finance minister had to clarify later that this wasn't a loan waiver, that banks are determined to recover loans from errant borrowers and that the liability on the borrowers still remains. In its bid to recover around Rs 535 crore due from beleaguered businessman Vijay Mallya, the Service Tax Department is looking at having more participation when it re-auctions his luxury personal jet on November 28-29. The e-auction will be carried out by MSTC, the department said, adding it had roped in a professional valuer for revaluation of the aircraft following a recent Bombay High Court order to do so at a reduced reserve price. The department had initially fixed a reserve price of Rs 152 crore but could not find a buyer following which the HC had ordered to review the price. But the department official refused to share the quantum of price reduction saying doing so would hamper sale prospects. This will be the third time that the department is going for e-auction of the plane as it failed both the times in the past. "We are trying to get potential buyers globally and we have got the forthcoming auction advertised in international journals in our bid to have more participation," a department official told PTI. "We are in touch with all the parties who have shown interest in the aircraft in the past and we hope they will participate in the sale process this time as well on November 28-29," he said. The highest bid received by the department at the second auction held in August was a measly Rs 27 crore against the reserve price of Rs 152 crore which was offered by a domestic firm SGI Commex. At the first auction held in June, only one bidder--a UAE-based aviation support firm Alna Aero Distributional Finance Holdings--had participated and had made an offer of Rs 1.09 crore for the jet. The department has got conducted borescope, which is a technical analysis of the plane, by Air India Engineering. "We have got borescope of the aircraft conducted by Air India Engineering," he said. After two unsuccessful attempts to auction debt-ridden liquor baron Vijay Mallya’s personal aircraft Airbus A319-133 CJ, the Service Tax Department on Monday issued online bids for the sale of the corporate jet yet again to recover dues of Rs 800 crore from the defunct Kingfisher Airlines. Ganesh Yadav, a senior official with the state-run MSTC Limited, which is conducting the e-auction for the sale of the aircraft said they have not been able to get potential buyers and so they have put the aircraft for re-auction for the third time. “The global online e-auction for the aircraft will be held on March 15 and 16. We will conclude it only if we get a good deal,” the official explained adding that they are yet to take a call on auctioning off five ATR aircraft and two helicopters of KFA that were also confiscated by the Service Tax Department in December 2013. According to airlines sources, the Mallya's lavish corporate jet aircraft is worth over 550 crore but the government has been able to get a little over 100 crore through previous global auction. "Clearly nobody wants to ride on a horse, whose owner has not serviced and taken care of it well over the years," said an industry official. Other than Mallya’s jet, five ATR aircraft and two helicopters of the defunct Kingfisher Airlines have been confiscated by the Service Tax Department in December 2013.These planes are currently at Mumbai International Airport. The Service Tax Department, which seized the Airbus A319 (of the defunct Kingfisher Airlines) in December 2013, had appointed Air India as a technical consultant for the sale of the aircraft. 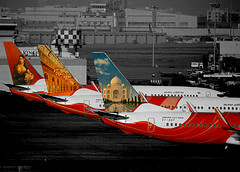 Kingfisher Airlines was grounded in October 2012. The prospective bidders will have to submit interest-free pre-Bid Earnest Money Deposit (EMD or the initial amount to be deposited before participating in the bidding is Rs one crore for all bidders is Rs 1 crore. The previous bidding on the same was conducted on November 28-29 by MSTC, the selling agent of the Service Tax Department. The aircraft is owned by C J Leasing (Cayman) Ltd and was given on lease to the now defunct Kingfisher Airlines. In 2013, the Bombay High Court observed there was no legal trouble in an auction of the aircraft which is on the financial lease. Proceeds of the sale will be deposited with the High Court. Additionally, besides auctioning of KFA aircraft, banks too have begun the process of recovery of Rs 9,000 crore from Vijay Mallya. Other than Mallya’s jet, five ATR aircraft and two helicopters of the defunct Kingfisher Airlines have been confiscated by the Service Tax Department in December 2013. These planes are currently at Mumbai International Airport. Those ATRs are certainly not at BOM. They're at MAA, AFAIK. Loans defaulter and fugitive Vijay Mallya today blamed "faulty" Pratt & Whitney (PW) engines for the collapse of his Kingfisher Airlines business. Mallya also said on Twitter that he's sued a company called IAE, which is a PW Group Company, for compensation towards "defective" aircraft engines supplied to Kingfisher Airlines. "Not surprised at DGCA enquiry into Pratt & Whitney aircraft engines. Kingfisher Airlines sadly collapsed also due to faulty engines. We have sued IAE a Pratt & Whitney Group Company for compensation towards defective aircraft engines supplied to Kingfisher Airlines." The former liquor baron's comment came two days after it was revealed that India's aviation regulator is investigating Pratt & Whitney engines in A320 NEO planes. The Directorate General of Civil Aviation (DGCA) on Tuesday ordered a detailed examination of the engines after planes installed with them continually developed snags. These engines have been plagued with issues like slow engine start-up times and erroneous engine software messages. For the fourth time, the Service Tax Department has failed to find a buyer for the personal jet of Vijay Mallya. This is despite the fact that it cut the reserve price to $12.5 million from the earlier $22.5 million on the Bombay High Court’s direction in a related case. The department had invited global bids for selling off Mallya’s jet, grounded at the Mumbai airport, for recovery of its dues. The latest bidding was conducted by MSTC on March 15-16, a senior official of the department said, adding it failed despite reduction of reserve price to $12.5 million. The only bidder who participated was the US-based Aviation Solution LLP which quoted just Rs 17 crore ($2.65 million), the official said. With efforts to auction an Airbus 319 owned by Kingfisher Airlines failing to find buyers for the fourth time, Bombay high court on Monday said the aircraft, parked at the airport here, should be removed at the earliest. "The aircraft has been occupying space at the airport for five years. If it is not airworthy, remove it immediately from the airport," said a division bench of Justices Satyaranjan Dharmadhikari and Bharati Dangre. The official liquidator of the Karnataka high court is in-charge of the assets and records of the airline. The aircraft was seized by sales tax department over dues of Rs 1,000 crore, liable to be paid by the airline, owned by businessman Vijay Mallya. The aircraft price had been reduced from $22.5 million to $12.5 million at the auctions. Airport authorities had informed the HC that the aircraft's value had depreciated and it must be sold as scrap. Vijay Mallya’s luxury jet, which bears his initials ‘VT-VJM’ in its registration number, finally found a buyer on Friday. .
After at least three failed auctions and protracted legal procedures, the Airbus A319-133C VT-VJM MSN 2650 was auctioned by the official liquidator attached to the Karnataka high court in Bengaluru. The US-based Aviation Management Sales, LLC, emerged the highest bidder as the auction was closed for the bid price of Rs 34.8 crore ($5.05 million). The highest bid is subject to the approval of the Bombay high court. The bid is higher than the ones received at the previous e-auctions conducted by the service tax department. The bid opened at $1.9 million. The auction was held to recover dues and penalties owed to the service tax department by Mallya’s Kingfisher Airlines (now in liquidation). “The grounded corporate jet is a sort of a prize catch as its customised interiors are unmatched in luxury. While its current list price would be approximately around $100 million with a standard specification, it was sold at dirt cheap price due to its grounded condition. It was not in airworthy condition as it has been grounded for nearly five years,” said a person privy to the development. Vijay Mallya’s private jet, Airbus A 319 (VT – VJM), which was auctioned to US-based Aviation Management Sales (AMS), is being dismantled at the Air India hangar for the past few weeks as making it fly-worthy had become difficult. After Kingfisher Airlines was grounded, the Service Tax Department had seized the aircraft. The AMS, which won the bid for the seized aircraft for Rs 34 crore in June last year, was unable to take possession of the aircraft because of bureaucratic hurdles. Three previous bids had filed to attract any buyers. Under the bidding conditions, the aircraft had to be removed from the airport premises within 60 days, said sources in the aviation industry. On February 13, the aircraft was towed from the Lima apron along the Kalina Kurla road to the Air India hangar. Air India’s regional director (West) Mukesh Bhatia told Mumbai Mirror, “This aircraft can’t be made fly-worthy. It is being dismantled in our workshop. 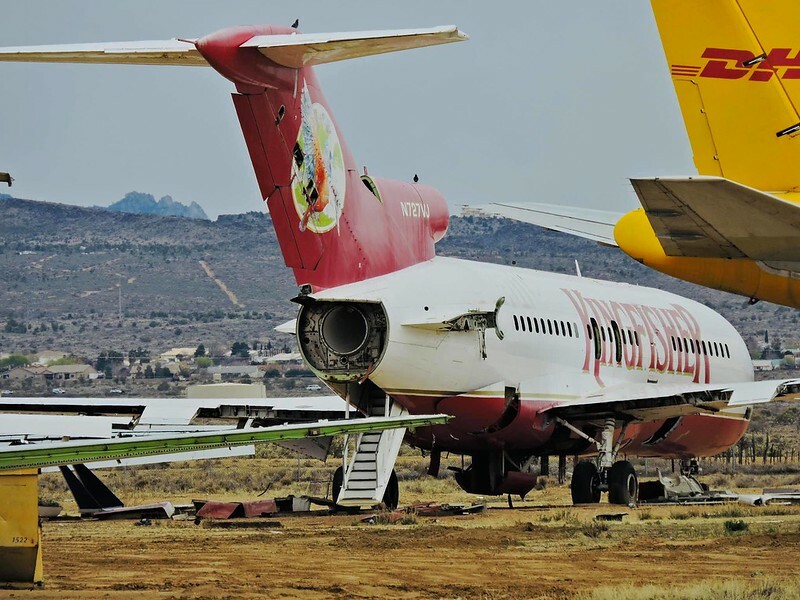 The process of dismantling is on and it will take some time.” Sources said that AMS requested Air India to dismantle the aircraft and send them the parts. The plane was attached by the service tax department in December 2013. It was only after the airport authorities moved the Bombay High Court that the service tax department was forced to auction the jet. The Mumbai International Airport Limited told the court that it was facing a loss as the jet was parked permanently and was resulting in non-productive use of its space. The Registrar of Companies was appointed as the official liquidator of all the assets of Kingfisher Airlines by the Karnataka High Court in 2014. The permission of the official liquidator appointed by the High Court of Karnataka was granted for disposing of the aircraft in 2016. Dee Garay, chief financial officer of AMS did not comment on the issue. The official liquidator and the MIAL spokesperson also did not comment. The Fissure-King's original private jet, N727VJ, seems to have relatively outlived his Hawker & ACJ; as seen at Kingman Airport, Arizona on 11 March 2019.